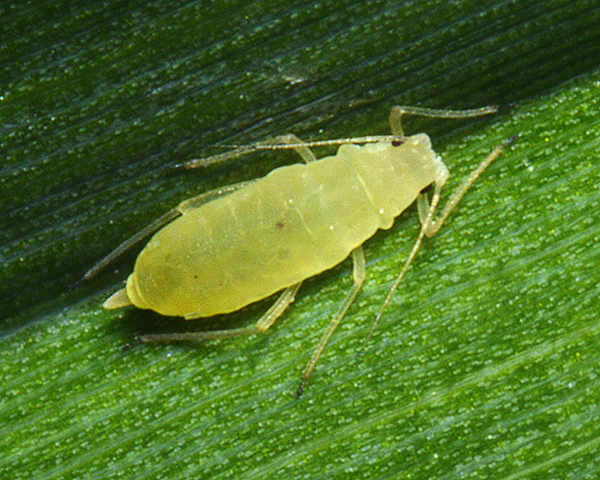 Hyalopteroides are medium sized elongate-oval green aphids, the adult viviparae of which may be winged or wingless. Their antennal tubercles are well developed but rather low. The antennae are shorter than the body. The siphunculi are short and cylindrical and the cauda is long, tongue-shaped and blunt. There is only one species in the Hyalopteroides genus, which is described below. The adult aptera (see first picture below) of Hyalopteroides humilis is medium sized elongate-oval pale yellowish green. The dorsal cuticle is rugosely sculptured and is not mealy. The antennae are shorter than the body. Antennal tubercles are well developed but rather low and have a small pointed process on the inner side of each of them, projecting forwards, with a hair on top of it. The median frontal tubercle is flat. The siphunculi are very small and thin, about 0.3-0.4 times the length of the cauda, with a barely visible apical flange. The cauda is long, tongue-shaped and blunt. 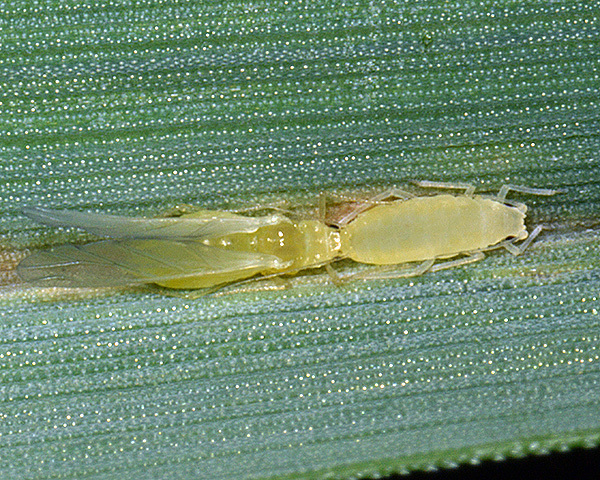 The alate Hyalopteroides humilis (see second picture above on grass blade with adult aptera) is also pale yellowish green with no abdominal markings. The head, antennae, legs, siphunculi and cauda are darker than in the aptera, and the wing veins are weakly brown-bordered. The cocksfoot aphid (Hyalopteroides humilis) lives along the midline on the uppersides of leaves of cocksfoot grass (Dactylis glomerata). There is no host alternation and the aphid is not attended by ants. The yellowish-brown feeding damage along the midline shown in the picture is characteristic. Males have been recorded, but most populations have probably lost the sexual stage in the life cycle. Hyalopteroides humilis is found in Europe east to Russia and in North America.